Round the Fire. X. - The Story of B 24 is a short story written by Arthur Conan Doyle first published in The Strand Magazine in march 1899. "'Do not hurt him,' said she; 'I think that his punishment may safely be left to the law.'" "He began to talk about the riches of mannering hall." "'Don't be frightened!' said she." 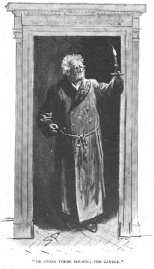 "He stood there holding the candle." He was a man that liked to talk. It seemed as if a spirit from above was standing in front of me. We throw a hundred or so of the medals into the bag. I told my story when I was taken, and no one would listen to me. Then I told it again at the trial — the whole thing absolutely as it happened, without so much as a word added, I set it all out truly, so help me God, all that Lady Mannering said and did, and then all that I had said and done, just as it occurred. And what did I get for it? "The prisoner put forward a rambling and inconsequential statement, incredible in its details, and unsupported by any shred of corroborative evidence." That was what one of the London papers said, and others let it pass as if I had made no defence at all. And yet, with my own eyes I saw Lord Mannering murdered, and I am as guiltless of it as any man on the jury that tried me. Now, sir, you are there to receive the petitions of prisoners. It all lies with you. All I ask is that you read it — just read it — and then that you make — an inquiry or two about the private character of this "lady" Mannering, if she still keeps the name that she had three years ago, when to my sorrow and ruin I came to meet her. You could use a private inquiry agent or a good lawyer, and you would soon learn enough to show you that my story is the true one. Think of the glory it would be to you to have all the papers saying that there would have been a shocking miscarriage of justice if it had not been for your perseverance and intelligence! That must be your reward, since I am a poor man and can offer you nothing. But if you don't do it, may you never lie easy in your bed again! May no night pass that you are not haunted by the thought of the man who rots in gaol because you have not done the duty which you are paid to do! But you will do it, sir, I know. Just make one or two inquiries, and you will soon find which way the wind blows. Remember, also, that the only person who profited by the crime was herself, since it changed her from an unhappy wife to a rich young widow, There's the end of the string in your hand, and you only have to follow it up and see where it leads to. Mind you, sir, I make no complaint as far as the burglary goes. I don't whine about what I have deserved, and so far I have had no more than I have deserved. Burglary it was, right enough, and my three years have gone to pay for it. It was shown at the trial that I had had a hand in the Merton Cross business, and did a year for that, so my story had the lees attention on that account. A man with a previous conviction never gets a really fair trial. I own to the burglary, but when it comes to the murder which brought me a lifer — any judge but Sir James might have given me the gallows—then I tell you that I had nothing to do with it, and that I am an innocent man. And now I'll take that night, the 13th of September, 1894, and I'll give you just exactly what occurred, and may God's hand strike me down if I go one inch over the truth. I had been at Bristol in the summer looking for work, and then I had a notion that I might get something at Portsmouth, for I was trained as a skilled mechanic, so I came tramping my way across the south of England, and doing odd jobs as I went. I was trying all I knew to keep off the cross, for I had done a year in Exeter Gaol, and I had had enough of visiting Queen Victoria. But it's cruel hard to get work when once the black mark is against your name, and it was all I could do to keep soul and body together. At last, after ten days of wood-cutting and stone-breaking on starvation pay, I found myself near Salisbury with a couple of shillings in my pocket, and my boots and my patience clean wore out. There's an ale-house called "The Willing Mind," which stands on the road between Blandford and Salisbury, and it was there that night I engaged a bed. I was sitting alone in the taproom just about closing time, when the innkeeper—Allen his name was— came beside me and began yarning about the neighbours. 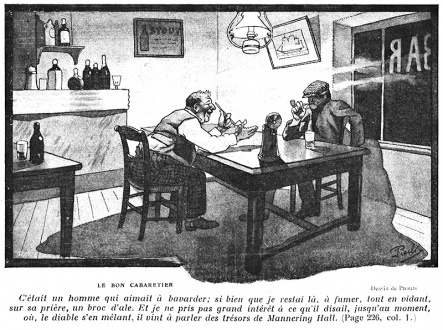 He was a man that liked to talk and to have some one to listen to his talk, so I sat there smoking and drinking a mug of ale which he had stood me; and I took no great interest in what he said until he began to talk (as the devil would have it) about the riches of Mannering Hall. "Meaning the large house on the right before I came to the village?" said I. "The one that stands in its own park?" "Exactly," said he — and I am giving all our talk so that you may know that I am telling you the truth and hiding nothing. "The long white house with the pillars," said he. "At the side of the Blandford Road." Now I had looked at it as I passed, and it had crossed my mind, as such thoughts will, that it was a very easy house to get into with that great row of ground windows and glass doors. I had put the thought away from me, and now here was this landlord bringing it back with his talk about the riches within. I said nothing, but I listened, and as luck would have it, he would always come back to this one subject. "He was a miser young, so you can think what he is now in his age," said he. "Well, he's had some good out of his money." "What good can he have had if he does not spend it?" said I. "Well, it bought him the prettiest wife in England, and that was some good that he gob out of it She thought she would have the spending of it, but she knows the difference now." "Who was she then?" I asked, just for the sake of something to say. "She was nobody at all until the old Lord made her his Lady," said he. "She came from up London way, and some said that she had been on the stage there, but nobody knew. The old Lord was away for a year, and when he came home he brought a young wife back with him, and there she has been ever since. 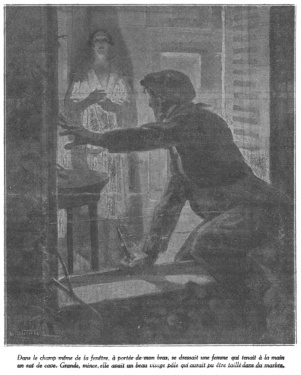 Stephens, the butler, did tell me once that she was the light of the house when fust she came, but what with her husband's mean and aggravatin' way, and what with her loneliness—for he hates to see a visitor within his doors; and what with his bitter words—for he has a tongue like a hornet's sting, her life all went out of her, and she became a white, silent creature, moping about the country lanes. Some say that she loved another man, and that it was just the riches of the old Lord which tempted her to be false to her lover, and that now she is eating her heart out because she has lost the one without being any nearer to the other, for she might be the poorest woman in the parish for all the money that she has the handling of." Well, sir, you can imagine that it did not interest me very much to hear about the quarrels between a Lord and a Lady. What did it matter to me if she hated the sound of his voice, or if he put every indignity upon her in the hope of breaking her spirit, and spoke to her as he would never have dared to speak to one of his servants? The landlord told me of these things, and of many more like them, but they passed out of my mind, for they were no concern of mine. But what I did want to hear was the form in which Lord Mannering kept his riches. Title-deeds and stock certificates are but paper, and more danger than profit to the man who takes them. But metal and stones are worth a risk. And then, as if he were answering my very thoughts, the landlord told me of Lord Mannering's great collection of gold medals, that it was the most valuable in the world, and that it was reckoned that if they were put into a sack the strongest man in the parish would not be able to raise them. Then his wife called him, and he and I went to our beds. I am not arguing to make out a case for myself, but I beg you, sir, to bear all the facts in your mind, and to ask yourself whether a man could be more sorely tempted than I was. I make bold to say that there are few who could have held out against it. 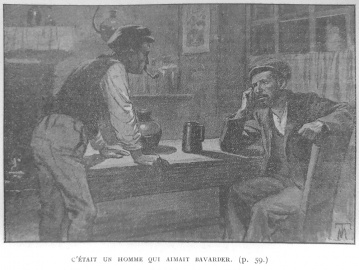 There I lay on my bed that night, a desperate man without hope or work, and with my last shilling in my pocket. I had tried to be honest, and honest folk had turned their backs upon me. They taunted me for theft; and yet they pushed me towards it. I was caught in the stream and could not get out. And then it was such a chance: the great house all lined with windows, the golden medals which could be easily be melted down. It was like putting a loaf before a starving man and expecting him not to eat it. I fought against it for a time, but it was no use. At last I sat up on the side of my bed, and I swore that that night I should either be a rich man and able to give up crime for ever, or that the irons should be on my wrists once more. 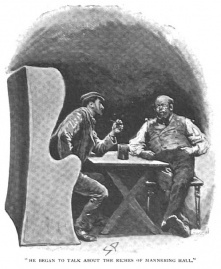 Then I slipped on my clothes, and, having put a shilling on the table —for the landlord had treated me well, and I did not wish to cheat him — I passed out through the window into the garden of the inn. There was a high wall round this garden, and I had a job to get over it, but once on the other side it was all plain sailing. I did not meet a soul upon the road, and the iron gate of the avenue was open. No one was moving at the lodge. The moon was shining, and I could see the great house glimmering white through an archway of trees. I walked up it for a quarter of a mile or so, until I was at the edge of the drive, where it ended in a broad, gravelled space before the main door. There I stood in the shadow and looked at the long building, with a full moon shining in every window and silvering the high stone front. I crouched there for some time, and I wondered where I should find the easiest entrance. The corner window of the side seemed to be the one which was least overlooked, and a screen of ivy hung heavily over it. My best chance was evidently there. I worked my way under the trees to the back of the house, and then crept along in' the black shadow of the building. A dog barked and rattled his chain, but I stood waiting until he was quiet, and then I stole on once more until I came to the window which I had chosen. It is astonishing how careless they are in the country, in places far removed from large towns, where the thought of burglars never enters their heads. I call it setting temptation in a poor man's way when he puts his hand, meaning no harm, upon a door, and finds it swing open before him. In this case it was not so bad as that, but the window was merely fastened with the ordinary catch, which I opened with a push from the blade of my knife. I pulled up the window as quickly as possible, and then I thrust the knife through the slit in the shutter and prized it open. They were folding shutters, and I shoved them before me and walked into the room. "Good evening, sir! You are very welcome!" said a voice. I've had some starts in my life, but never one to come up to that one. There, in the opening of the shutters, within reach of my arm, was standing a woman with a small coil of wax taper burning in her hand. She was tall and straight and slender, with a beautiful white face that might have been cut out of clear marble, but her hair and eyes were as black as night. 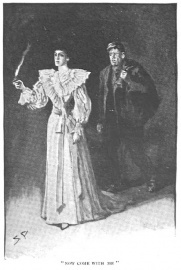 She was dressed in some sort of white dressing-gown which flowed down to her feet, and what with this robe and what with her face, it seemed as if a spirit from above was standing in front of me. My knees knocked together, and I held on to the shutter with one hand to give me support. I should have turned and run away if I had had the strength, but I could only just stand and stare at her. She soon brought me back to myself once more. "Don't be frightened!" said she, and they were strange words for the mistress of a house to have to use to a burglar. "I saw you out of my bedroom window when you were hiding under those trees, so I slipped downstairs, and then I heard you at the window. I should have opened it for you if you had waited, but you managed it yourself just as I came up." I still held in my hand the long clasp-knife with which I had opened the shutter. I was unshaven and grimed from a week on the roads. Altogether, there are few people who would have cared to face me alone at one in the morning; but this woman, if I had been her lover meeting her by appointment, could not have looked upon me with a more welcoming eye. She laid her hand upon my sleeve and drew me into the room. "What's the meaning of this, ma'am? Don't get trying any little games upon me," said I, in my roughest way—and I can put it on rough when I like. "It'll be the worse for you if you play me any trick," I added, showing her my knife. "I will play you no trick," said she. "On the contrary, I am your friend, and I wish to help you." "Excuse me, ma'am, but I find it hard to believe that," said I. "Why should you wish to help me?" "I have my own reasons," said she; and then suddenly, with those black eyes blazing out of her white face: "It's because I hate him, hate him, hate him! Now you understand." I remembered what the landlord had told me, and I did understand. I looked at her Ladyship's .face, and I knew that I could trust her. She wanted to revenge herself upon her husband. She wanted to hit him where it would hurt him most—upon the pocket. She hated him so that she would even lower her pride to take such a man as me into her confidence if she could gain her end by doing so. I've hated some folk in my time, but I don't think I ever understood what hate was until I saw that woman's face in the light of the taper. "You'll trust me now?" said she, with another coaxing touch upon my sleeve. "I can guess who you are." "I daresay my wrongs are the talk of the county. But what does he care for that? He only cares for one thing in the whole world, and that you can take from him this night. Have you a bag?" "Shut the shutter behind you. Then no one can see the light. You are quite safe. The servants all sleep in the other wing. I can show you where all the most valuable things are. You cannot carry them all, so we must pick the best." The room in which I found myself was long and low, with many rugs and skins scattered about on a polished wood floor. Small cases stood here and there, and the walls were decorated with spears and swords and paddles, and other things which find their way into museums. There were some queer clothes, too, which had been brought from savage countries, and the lady took down a large leather sack-bag from among them. "This sleeping-sack will do," said she. "Now come with me and I will show you where the medals are." It was like a dream to me to think that this tall, white woman wag the lady of the house, and that she was lending me a hand to rob her own home. I could have burst out laughing at the thought of it, and yet there was something in that pale face of hers which stopped my laughter and turned me cold and serious. She swept on in front of me like a spirit, with the green taper in her hand, and I walked behind with my sack until we came to a door at the end of this museum. It was locked, but the key was in it, and she led me through. The room beyond was a small one, hung all round with curtains which had pictures on them. It was the hunting of a deer that was painted on it, as I remember, and in the flicker of that light you'd have sworn that the dogs and the horses were streaming round the walls. The only other thing in the room was a row of cases made of walnut, with brass ornaments. They had glass tops, and beneath this glass I saw the long lines of those gold medals, some of them as big as a plate and half an inch thick, all resting upon red velvet and glowing and gleaming in the darkness. My fingers were just itching to be at them, and I slipped my knife under the lock of one of the cases to wrench it open. "Wait a moment," said she, laying her hand upon my arm. "You might do better than this." "I am very well satisfied, ma'am," said I, "and much obliged to your Ladyship for kind assistance." "You can do better," she repeated. "Would not golden sovereigns be worth more to you than these things?" "Why, yes," said I. "That's best of all,"
"Well," said she. "He sleeps just above our head. It is but one short staircase. There is a tin box with money enough to fill this bag under his bed." "How can I get it without waking him?" "What matter if he does wake?" She looked very hard at me as she spoke. "You could keep him from calling out." "No, no, ma'am, I'll have none of that." "Just as you like," said she. "I thought that you were a stout-hearted sort of man by your appearance, but I see that I made a mistake. If you are afraid to run the risk of one old man, then of course you cannot have the gold which is under his bed. You are the best judge of your own business, but I should think that you would do better at some other trade." "I'll not have murder on my conscience." "You could overpower him without harming him. I never said anything of murder. The money lies under the bed. But if you are faint-hearted, it is better that you should not attempt it." She worked upon me so, partly with her scorn and partly with this money that she held before my eyes, that I believe I should have yielded and taken my chances upstairs, had it not been that I saw her eyes following the struggle within me in such a crafty, malignant fashion, that it was evident she was bent upon making me the tool of her revenge, and that she would leave me no choice but to do the old man an injury or to be captured by him. She felt suddenly that she was giving herself away, and she changed her face to a kindly, friendly smile, but it was too late, for had had my warning. "I will not go upstairs," said I. "I have all I want here." She looked her contempt at me, and there never was a face which could look it plainer. "Very good. You can take these medals. I should be glad if you would begin at this end. I suppose they will all be the same value when melted down, but these are the ones which arc the rarest, and, therefore, the most precious to him. It is not necessary to break the locks. If you press that brass knob you will find that there is a secret spring. So! Take that small one first —it is the very apple of his eye." She had opened one of the cases, and the beautiful things all lay exposed before me. I had my hand upon the one which she had pointed out, when suddenly a change came over her face, and she held up one finger as a warning. "Hist!" she whispered. "What is that?" Far away in the silence of the house we heard a low, dragging, shuffling sound, and the distant tread of feet. She closed and fastened the case in an instant. "It's my husband!" she whispered. "All right. Don't be alarmed. I'll arrange it. Here! Quick, behind the tapestry! " She pushed me behind the painted curtains upon the wall, my empty leather bag still in my hand, Then she took her taper and walked quickly into the room from which we had come. From where I stood I could see her through the open door. "Is that you, Robert? " she cried. The light of a candle shone through the door of the museum, and the shuffling steps came nearer and nearer. Then I saw a face in the doorway, a great, heavy face, all lines and creases, with a huge curving nose, and a pair of gold glasses fixed across it. He had to throw his head back to see through the glasses, and that great nose thrust out in front of him like the beak of some sort of fowl. He was a big man, very tall and burly, so that in his loose dressing-gown his figure seemed to fill up the whole doorway. He had a pile of grey, curling hair all round his head, but his face was clean-shaven. His mouth was thin and small and prim, hidden away under his long, masterful nose. 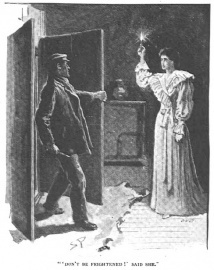 He stood there, holding the candle in front of him, and looking at his wife with a queer, malicious gleam in his eyes. It only needed that one look to tell me that he was as fond of her as she was of him. "How's this?" he asked. "Some new tantrum? What do you mean by wandering about the house? Why don't you go to bed? " "I could not sleep," she answered. She spoke languidly and wearily. If she was an actress once, she had not forgotten her calling. "Might I suggest," said he, in the same mocking kind of voice, "that a good conscience is an excellent aid to sleep?" "That cannot be true," she answered, "for you sleep very well." "I have only one thing in my life to be ashamed of," said he, and his hair bristled up with anger until he looked like an old cockatoo. "You know best what that is. It is a mistake which has brought its own punishment with it." "To me as well as to you. Remember that!" "You have very little to whine about. It was I who stooped and you who rose." "Yes, rose. I suppose you do not deny that it is promotion to exchange the music-hall for Mannering Hall. Fool that I was ever to take you out of your true sphere!" "If you think so, why do you not separate?" "Because private misery is better than public humiliation. Because it is easier to suffer for a mistake than to own to it. Because also I like to keep you in my sight, and to know that you cannot go back to him." "You villain! You cowardly villain!" "Yes, yes, my lady. I know your secret ambition, but it shall never be while I live, and if it happens after my death I will at least take care that you go to him as a beggar. You and dear Edward will never have the satisfaction of squandering my savings, and you may make up your mind to that, my lady. Why are those shutters and the window open?" "I found the night very close." "It is not safe. How do you know that some tramp may not be outside? Are you aware that my collection of medals is worth more than any similar collection in the world? You have left the door open also. What is there to prevent any one from rifling the cases?" "I know you were. I heard you moving about in the medal room, and that was why I came down. What were you doing?" "Looking at the medals. What else should I be doing?" "This curiosity is something new." He looked suspiciously at her and moved on towards the inner room, she walking beside him. It was at this moment that I saw something which startled me. I had laid my clasp-knife open upon the top of one of the cases, and there it lay in full view. 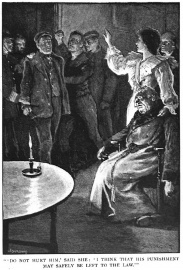 She saw it before he did, and with a woman's cunning she held her taper out so that the light of it came between Lord Mannering's eyes and the knife. Then she took it in her left hand and held it against her gown out of his sight. He looked about from case to case—I could have put my hand at one time upon his long nose—but there was nothing to show that the medals had been tampered with, and so, still snarling and grumbling, he shuffled off into the other room once more. And now I have to speak of what I heard rather than of what I saw, but I swear to you, as I shall stand some day before my Maker, that what I say is the truth. When they passed into the outer room I saw him lay his candle upon the corner of one of the tables, and he sat himself down, but in such a position that he was just out of my sight. She moved behind him, as I could tell from the fact that the light of her taper threw his long, lumpy shadow upon the floor in front of him. Then he began talking about this man whom he called Edward, and every word that he said was like a blistering drop of vitriol. He spoke low, so that I could not hear it all, but from what I heard I should guess that she would as soon have been lashed with a whip. At first she said some hot words in reply, but then she was silent, and he went on and on in that cold, mocking voice of his, nagging and insulting and tormenting, until I wondered that she could bear to stand there in silence and listen to it. Then suddenly I heard him say in a sharp voice, "Come from behind me! Leave go of my collar! What! would you dare to strike me?" There was a sound like a blow, just a soft sort of thud, and then I heard him cry out, "My God, it's blood!" He shuffled with his feet as if he was getting up, and then I heard another blow, and lie cried out, "Oh, you she-devil!" and was quiet, except for a dripping and splashing upon the floor. I ran out from behind my curtain at that, and rushed into the other room, shaking all over with the horror of it. 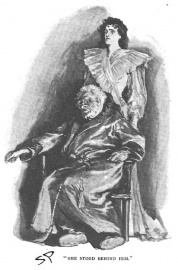 The old man had slipped down in the chair, and his dressing-gown had rucked up until lie looked as if he had a monstrous hump to his back. His head, with the gold glasses still fixed on his nose, was lolling over upon one side, and his little mouth was open just like a dead fish. I could not see where the blood was coming from, but I could still hear it drumming upon the floor. She stood behind him with the candle shining full upon her face. Her lips were pressed together and her eyes shining, and a touch of colour had come into each of her cheeks. It just wanted that to make her the most beautiful woman I had ever seen in my life. "You've done it now!" said I. "Yes," said she, in her quiet way, "I've done it now." "What are you going to do?" I asked. "They'll have you for murder as sure as fate." "Never fear about me. I have nothing to live for, and it does not matter. Give me a hand to set him straight in the chair. It is horrible to see him like this!" I did so, though it turned me cold all over to touch him. Some of his blood came on my hand and sickened me. "Now," said she, "you may as well have the medals as any one else. Take them and go." "I don't want them. I only want to get away. I was never mixed up with a business like this before." "Nonsense!" said she. "You came for the medals, and here they are at your mercy. Why should you not have them? There is no one to prevent you." I held the bag still in my hand. She opened the case, and between us we throw a hundred or so of the medals into it. They were all from the one case, but I could not bring myself to wait for any more. Then I made for the window, for the very air of this house seemed to poison me after what I had seen and heard. As I looked back, I saw her standing there, tall and graceful, with the light in her hand, just as I had seen her first. She waved good-bye, and I waved back at her and sprang out into the gravel drive. I thank God that I can lay my hand upon my heart and say that I have never done a murder, but perhaps it would be different if I had been able to read that woman's mind and thoughts. There might have been two bodies in the room instead of one if I could have seen behind that last smile of hers. But I thought of nothing but of getting safely away, and it never entered my head how she might be fixing the rope round my neck. 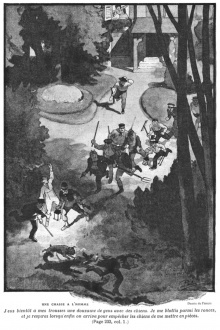 I had not taken five steps out from the window skirting down the shadow of the house in the way that I had come, when I heard a scream that might have raised the parish, and then another and another. "Murder!" she cried. "Murder! Murder! Help!" and her voice rang out in the quiet of the night-time and sounded over the whole country-side. It went through my head, that dreadful cry. In an instant lights began to move and windows to fly up, not only in the house behind me, but at the lodge and in the stables in front. Like a frightened rabbit I bolted down the drive, but I heard the clang of the gate being shut before I could reach it. Then I hid my bag of medals under some dry fagots, and I tried to get away across the park, but some one saw me in .the moonlight, and presently I had half a dozen of them with dogs upon my heels. I crouched down among the brambles, but those dogs were too many for me, and I was glad enough when the men came up and prevented me from being torn into pieces. They seized me, and dragged me back to the room from which I had come. "Is this the man, your Ladyship?" asked the oldest of them—the same whom I found out afterwards to be the butler. She had been bending over the body, with her her handkerchief to her eyes, and now she turned upon me with the face of a fury. Oh, what an actress that woman was! "Yes, yes, it is the very man," she cried. Oh, you villain, you cruel villain, to treat an old man so!" There was a man there who seemed to be a village constable. He laid his hand upon my shoulder. "What do you say to that?" said he. "It was she who did it," I cried, pointing at the woman, whose eyes never flinched before mine. "Come! come! Try another!" said the constable, and one of the men- servants struck at me with his fist. "I tell you that I saw her do it. She stabbed him twice with a knife. She first helped me to rob him, and then she murdered him." The footman tried to strike me again, but she held up her hand. "Do not hurt him," said she. "I think that his punishment may safely be left to the law." "I'll see to that, your Ladyship," said the constable. "Your Ladyship actually saw the crime committed, did you not?" "Yes, yes, I saw it with my own eyes. It was horrible. We heard the noise and we came down. My poor husband was in front. 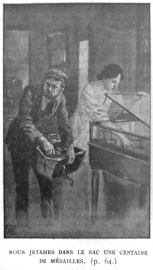 The man had one of the cases open, and was filling a black leather bag which he held in his hand. He rushed past us, and my husband seized him. There was a struggle, and he stabbed him twice. There you can see the blood upon his hands. If I am not mistaken, his knife is still in Lord Mannering's body." "Look at the blood upon her hands!" I cried. "She has been holding up his Lordship's head, you lying rascal," said the butler. "And here's the very sack her Ladyship spoke of," said the constable, as a groom came in with the one which I had dropped in my flight. "And hero are the medals inside it. That's good enough for me. We will keep him safe here to- night, and tomorrow the inspector and I can take him into Salisbury." "Poor creature," said the woman. "For my own part, I forgive him any injury which lie has done me. Who knows what temptation may have driven him to crime? His conscience and the law will give him punishment enough without any reproach of mine rendering it more bitter." I could not answer—I tell you, sir, I could not answer, so taken aback was I by the assurance of the woman. And so, seeming by my silence to agree to all that she had said, I was dragged away by the butler and the constable into the cellar, in which they locked me for the night. 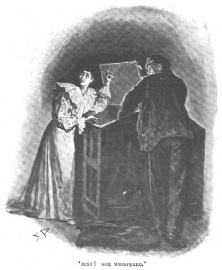 There, sir, I have told you the whole story of the events which led up to the murder of Lord Mannering by his wife upon the night of September the 14th, in the year 1894. Perhaps you will put my statement on one side as the constable did at Mannering Towers, or the judge afterwards at the county assizes. Or perhaps you will see that there is the ring of truth in what I say, and you will follow it up, and so make your name for ever as a man who does not grudge personal trouble where justice is to be done. I have only you to look to, sir, and if you will clear my name of this false accusation, then I will worship you as one man never yet worshipped another. But if you fail me, then I give you my solemn promise that I will rope myself up, this day month, to the bar of my window, and from that time on I will come to plague you in your dreams if ever yet one man was able to come back and to haunt another. What I ask you to do is very simple. Make inquiries about this woman, watch her, learn her past history, find out what use she is making of the money which has come to her, and whether there is not a man Edward as I have stated. If from all this you learn anything which shows you her real character, or which seems to you to corroborate the story which I have told you, then I am sure that I can rely upon your goodness of heart to come to the rescue of an innocent man. This page was last edited on 26 October 2018, at 09:45.